The Tory party social media presence is absolutely repulsive. It's not jest the fact that they spread so many misrepresentations, smears, and outright lies, it's the disgusting way that they do it, and the sick elitist mentality of the Tory strategists who believe they can lie like this with total impunity because the general public are too thick and gullible to see through their deceptions, even when they've resorted to reality-reversing Orwellian propaganda tactics. In this article I'm going to critique one Tweet from the @Conservatives Twitter account, but the problem is obviously wider than just a single Tweet. The @Conservatives account continually pushes misleading and downright dishonest political propaganda alongside multiple other misinformation accounts such as the vile @CCHQ account, and dozens of others. 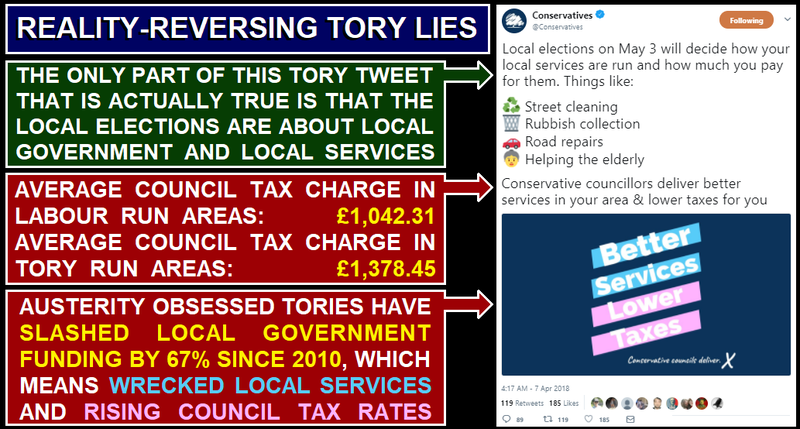 The most convincing lies always have a kernel of truth about them, and in this case it's the perfectly valid assertion that "local elections on May 3 will decide how your local services are run and how much you pay for them. Things like street cleaning, rubbish collection, road repairs and helping the elderly". This is actually true. So as the local election campaign heats up and the Tories and the right-wing media focus ever more effort on smearing Jeremy Corbyn in the hope of frightening people away from voting Labour at the local level, just remember that the Tories have admitted the truth here, and that local elections are actually about local government and local services, not about Jeremy Corbyn's personality and national level policies. Noting that local elections are principally about local issues does not mean that central government policy has no influence on local government and local services, in fact central government polcy can have a devastating impact on your local community. Since 2010 the Tories have slashed the Department of Communities and Local Government by an astounding 67% meaning disastrous consequences for local services up and down the country. The Tory obsession with ruinous hard-right austerity fanaticism is the principal reason that your Council Tax bill is going up again despite your local government services being in a worse state than they've ever been. Just think about the things the Tories listed in the tweet. Street cleaning and other maintenance services like grass cutting have been slashed. Bin collections have been scaled back from weekly to fortnightly, or even 3-weekly collections across the country. Surely everyone who drives has noticed the deterioration in the state of the roads over the last eight years? And surely everyone is aware that social care services for the frail and elderly have been massively reduced which not only leaves vulnerable people with inadequate care, it also increases pressure on already over-stretched NHS facilities when the victims of these cuts are left with nowhere else to turn but their local hospital. All of this is a direct consequence of the Tory fixation with hard-right austerity dogma, and the reason your Council Tax bill is going up again despite this collapse in the standard of your local services is that your local council desperately needs more cash to plug the worst and most dangerous of the shortfalls. 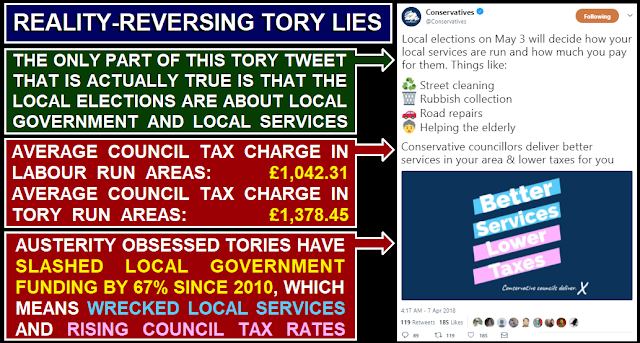 The text of the Tweet claims that "Conservative councillors deliver better services in your area & lower taxes for you". The first part of the claim is dubious and the second part is an outright lie. Even if we skip over the fact that Tory austerity dogma is the cause of collapsing local services up and down the country, the first claim that Tory councils "deliver better services in your area" is dubious because even at the local level Tories believe in the same hard-right austerity ideology. This fixation with austerity dogma that exists at every level of the Tory party means that they cut local services with an ideological zeal, believing that they're actually doing something wonderful by shutting down children's services, gutting social care, trashing local services, closing public facilities and flogging off publicly owned assets to their wealthy property speculator mates. Councils that are controlled by other parties are also suffering the ruinous consequences of the Tory austerity cuts, but at least they're generally being run by people who actually believe in stuff like public services and looking after the vulnerable. This means that at least they're more inclined to prioritise and protect public services to the best of their abilities, rather than gleefully slashing away out of adherence to the crazed hard-right austerity doctrine. Last year the Tory government's own figures admitted that the average Council Tax bill in Labour council areas is £336 cheaper than the average in Tory council areas. The claim that the Tories deliver "lower taxes" is an outright lie. If anyone wants to see an example of what Tory councils actually deliver, just take a look into the state of Tory run Northamptonshire Council which announced that they're essentially insolvent just a couple of months ago. If you want your local government to be run so badly its at risk of collapsing into insolvency like Northamptonshire then vote Tory, because Conservative councils deliver failure. Whether you vote Tory at the national level, or at the local level you're actually voting for worse services and higher taxes. People voting Tory at the national level caused the 67% cut to the local government budget, which has resulted in wrecked local services and rising Council tax bills. 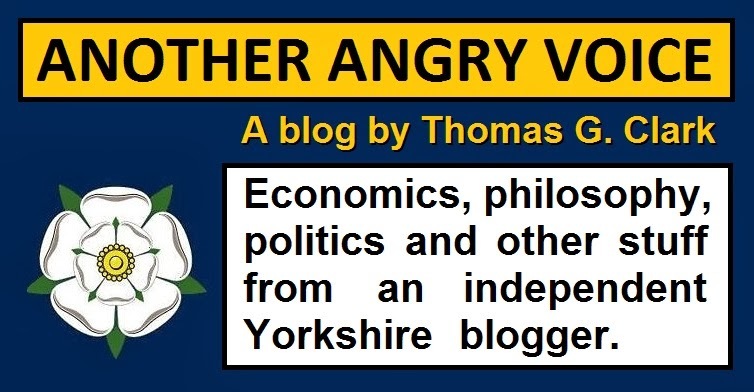 People voting Tory at the local lever results in people with the same hard-right austerity mentality gleefully gutting local services out of some deranged belief that systematically destroying local government services is a means of improving the nation! Perhaps the most shocking thing of all about this Tweet is the sheer arrogance of the people who devised it. They know as well as anyone that their own austerity fanaticism is the primary reason that people are paying higher Council Tax bills despite their local services being worse than ever. But they're so full of contempt for the "lower orders" that they see us as gullible enough to simply believe them when they feed us this kind of Orwellian "black is white" propaganda. All a person actually needs do to see through this brazen Tory propaganda is to look at their Council Tax bill and then observe the dreadful state of local services and public infrastructure in their local communities. But the people who devised these "Better Services Lower Taxes" and "Conservative councils deliver" slogans clearly assume people like us to be so thick, and so gullible, that we're incapable of doing even that.